The season of feasting and merry-making is upon us and it is time to ring in the Christmas cheer by planning your festive meals. Some hotels and restaurants have been receiving inquiries since early September. 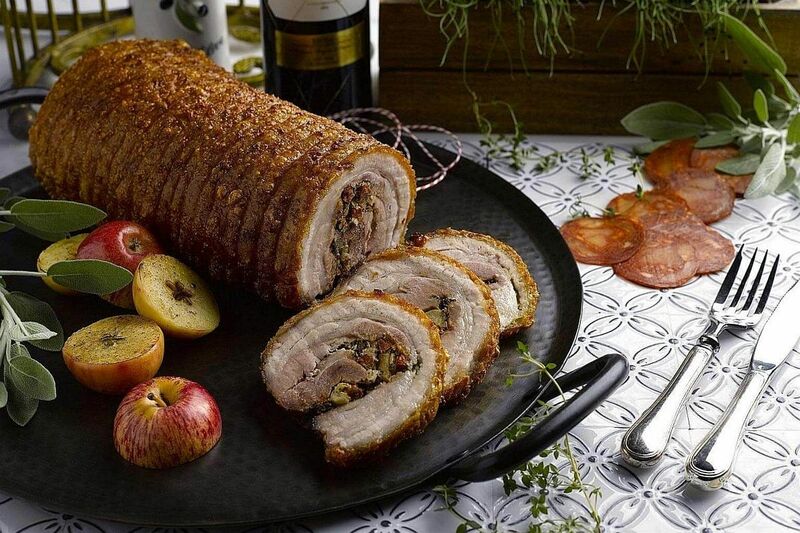 Pan Pacific Singapore's buffet restaurant Edge is almost fully booked for Christmas Day brunch, while Christmas Eve and Christmas Day meals are "filling up fast", says the hotel's area general manager, Mr Gino Tan. Edge's festive buffet starts tomorrow, a week earlier than last year, to cater to demand. For Regent Singapore, bookings this festive season are moving as fast as last year's. This year's offerings come with The Nutcracker theme in a collaboration with Canadian luxury tea blender Tealeaves and the Singapore Dance Theatre, which is putting on the ballet next month. It is also highlighting chocolate in selected dishes - both savoury and sweet, says the hotel's executive chef Angelo Ciccone, 36. Another themed meal comes from Bay Hotel Singapore's Rumah Rasa restaurant, which is presenting a Feast of Fire & Ice, catering to fans of the Game Of Thrones TV series. Indeed, hotels and restaurants are going all out for Christmas, with everything from Italian and French to German and Chinese and, of course, not forgetting plenty of desserts. Whether you are looking for a sumptuous lunch, leisurely afternoon tea or decadent dinner, The Sunday Times rounds up some options for the festive season. What: Meat lovers can head to The Carvery for its Spanish-inspired dishes and meats such as Iberico pork belly porchetta stuffed with chorizo and apple (weekends only); spit-roasted chicken with orange and rosemary; roast turkey; as well as Catalan seafood stew; squid and olive salad and red mullet fish with mojo verde (a sauce made with cilantro, garlic and extra virgin olive oil). On Christmas Eve and Christmas Day, the spread includes a whole Spanish suckling pig too. It is priced from $45 for adults and from $25 for children. What: Kick off your Christmas celebrations with a festive lunch at the one-Michelin-starred Saint Pierre restaurant. Starters include oscietra caviar with Japanese sea urchin, beetroot cured Atlantic salmon and XO cognac marinated foie gras terrine. The selection of mains includes whole blue lobster; roasted capon with heirloom carrot and braised chestnuts; and a winter garden of parsnip, raisins, leek, pumpkin, beetroot, pickled shallot and smoked celeriac, which is suitable for vegetarians. For dessert, choose between Saint Pierre's Manjari chocolate log cake and steamed date pudding with butterscotch sauce. It is priced at $68++ a person (three courses), $85++ a person (four courses) and $100++ a person (five courses). What: Savour an Italian feast (from $108++ a person) at LaBrezza, which starts with seafood on ice, followed by dishes such as stewed cod with escarole and housemade pickled vegetables; traditional eggplant parmigiana; meat-stuffed tortellini with chicken broth; and octopus with warm crushed potatoes. What: Jia Wei Chinese Restaurant's head chef Victor Lee features a South African premium abalone set menu ($88 a person, with a minimum of two people) with dishes such as pan-fried turkey breast with Guinness stout sauce; braised South African premium four-head abalone with beancurd and seasonal vegetables; and pan-seared Hokkaido scallop with spinach noodles. What: Bask in the festive vibes at SPRMRKT Kitchen & Bar, which offers a five-course menu ($86++ a person) that starts with an amuse bouche of trout confit with vodka chantilly, topped with avruga caviar. Mains include the "Holly" seafood fettucine with orange and green house-made noodles, grilled Spanish octopus, Scottish mussels, prawns and seared scallops in a white wine sauce; and twice-cooked Christmas turkey with satay peanut butter sauce. What: For a festive business lunch ($52++ for two courses, $62 for three courses), head to The Black Swan. For starters, choose from foie gras parfait with hazelnut crust, port wine jelly and toasted brioche; steak tartare with hand-chopped US beef, soft quail eggs and waffle crisps; and pan-seared George Bank Scallops with corn puree and crispy chicken skin. Main course options include herb-crusted Wakanui lamb rack with smoked aubergine puree, fondant potato and rosemary jus; roasted Iberian pork chop with potatoes au gratin, apple cider pan jus, prunes and armagnac; or Steak & Frites. What: Specially for Christmas, VLV's chef Martin Foo has created Hoisin-miso Iberico pork ribs and sauteed vegetables with olive pate ($24 a rib, minimum order of two ribs), perfect for sharing with other dishes from the menu. What: For a festive three-course set lunch ($35++ a person, add $30++ for wine pairing) with French flair, check out 1919 Waterboat House. To start, choose between butternut squash soup with sage and creme fraiche, and salmon tartare. For the main course, choose either pan-roasted bacon-wrapped turkey stuffed with manchego cheese and mushrooms or pan-seared sea bass with lemongrass oil, snow peas and cherry tomatoes. What: Get into the Christmas spirit with TWG Tea's set meal ($35) which includes a main course, Joy of Christmas Tea (black tea blended with spiced fruit and chocolate) and dessert. The main is grilled Wagyu beef skirt with black truffle and foie gras beef jus, accompanied with charred pears poached in Red Christmas Tea, mashed potatoes and cabbage braised with veal bacon and chestnut. Sweeten the meal with the Joy of Christmas Tea-infused yule log - a chocolate hazelnut sponge cake filled with a Joy of Christmas Tea-infused cream mousse and coated with a milk chocolate glaze. Add $10 for an eggnog-inspired mocktail or $12 for a cocktail infused with Joy of Christmas tea. What: Regent Singapore is collaborating with Canadian luxury tea blender Tealeaves and the Singapore Dance Theatre for a festive afternoon tea ($50 an adult, $26.50 a child) themed after The Nutcracker ballet. The three-tier stand comes with assorted finger sandwiches such as Wagyu beef carpaccio with rocket salad and parmesan cheese; and lemon and dill Scottish smoked salmon with sour cream on rye; as well as butter and Chuao chocolate scones. In addition, there will be specially plated desserts such as the Nutcracker gelato, with pecan brownie, caramelised pecans, salted caramel spread and crunchy milk chocolate pearls. Do not miss the dramatic Chocolate Snow On Fire, with 23 per cent white chocolate lemon yogurt mousse, amarena cherry jam, almond espuma, blackberry and raspberry sorbet, and raspberry jelly. It is flambed at the table. What: Take a break from Christmas shopping with Atrium's afternoon tea (from $38). Highlights include eggnog creme brulee tart; chendol entremet and duck rillettes with herb crostini. 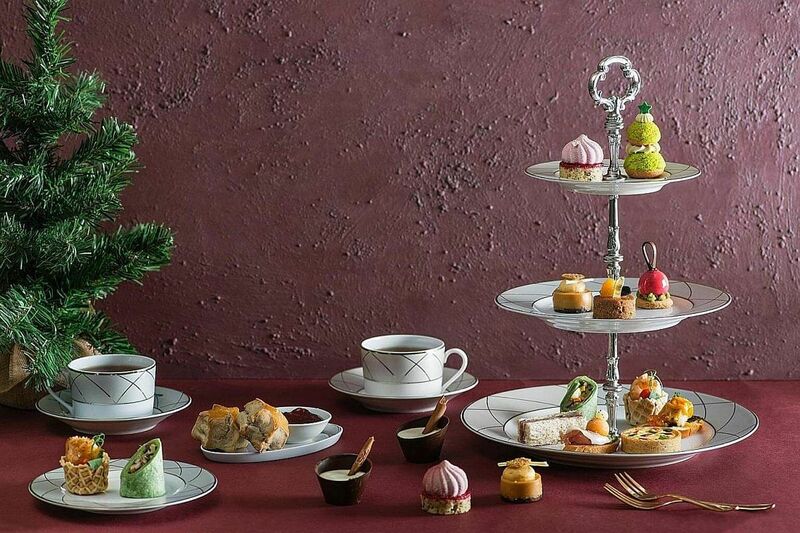 Specially for this season, the tea set comes with pistachio cranberry or classic scones. What: Have a leisurely afternoon tea ($118 for two people, with two flutes of festive cocktail, champagne and tea or coffee; or $88 for two people, with tea or coffee) at InterContinental Singapore's Lobby Lounge. The selection includes Parma ham melon crostini; turkey emmental cheese sandwich; and saffron curry crab meat with ikura on brioche. Sweet delights include Christmas fruit cake; pistachio choux tree; and vanilla orange crepe with chestnut-lychee sorbet. What: Capella's afternoon tea spread ($45++ a person) includes foie gras terrine with cherry puree, candied walnut and gingerbread crumble; turkey roulade with spinach and pistachio cream; and housemade salmon gravlax with pickled kumquat, green pea puree and dill oil. Dessert offerings include salted caramel and lemon curd tartlet; traditional mont blanc cheesecake; and assorted Christmas cookies. Do not miss the cranberry scones and almond marzipan stollen. 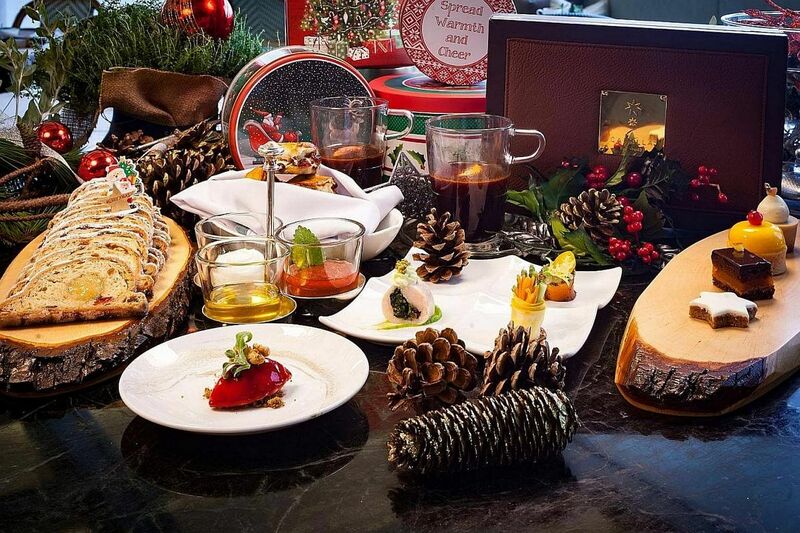 What: Partake in a decadent high tea buffet on Christmas Eve ($78++ an adult, $39++ a child aged six to 11) and Christmas Day ($98++ an adult, $49++ a child aged six to 11) at Shangri-La Hotel's The Rose Veranda. The spread includes roast turkey; roast lamb rack; barramundi with coconut and red lentil dhal, pineapple and coriander; and pork ribs. The buffet includes seafood, soup salad, sushi and cheese. There is also an array of desserts such as coconut, durian and pandan logcake; warm Christmas pudding with brandy sauce; and roasted pecan tart. What: Conrad Centennial Singapore's Lobby Lounge offers a daily afternoon tea set which includes mini bagels with roasted turkey and spicy cranberry sauce, petite sandwiches, as well as traditional fruit cake and mini snowman macarons. It is priced at $28++ a person or $48++ for two (with coffee and tea), and $46++ a person or $78++ for two (with champagne). What: There is always time for afternoon tea at Mandarin Oriental's Axis Bar and Lounge. Highlights include turkey foie gras roll with red cabbage stew; Christmas ham with brown toast and cranberry jam; and mozzarella with crab, apple slaw and avocado. Desserts include Christmas fruitcake, Manjari crunchy chocolate yule log and snow white coconut dacquoise. It is priced at $42 a person and $80 for two; and $52 a person, $100 for two on Christmas Day and New Year's Day. What: If you do not fancy traditional Christmas feasts, try the six-course hotpot set ($65++ a person, festive price at $49.80++) launched just in time for the festive season by soba restaurant Nadai Fujisoba Ni-Hachi. The seafood comes under a bed of frozen ice shavings - made with chicken and seafood stock - to keep the ingredients fresh. The stock is melted in the hotpot which cooks the seafood. It is complemented with soba, dashimaki tamago (Japanese omelette made with egg and dashi) and mashed buckwheat tempura. Complete the meal with matcha warabi mochi with caramel sauce. Info: Call 6708-8310 or e-mail h9474@sofitel.com. What: Indulge in modern Cantonese cuisine with Mitzo's festive menu ($128++ a person), which includes a trio starter of soya poached foie gras, roasted crispy pork belly and prawn in creamy bonito sauce. This is followed by double-boiled abalone soup with morel mushroom and turkey; and pulled noodles with shredded lamb shank. End with a dessert of chilled purple potato puree, coconut milk, vanilla ice cream and pineapple puff. What: Curate restaurant's chef de cuisine Benjamin Halat, who hails from Munich, brings a taste of Germany to Singapore with his menus ($158++ a person for five-course dinner, $198++ for eight-course dinner). Highlights include a selection of canapes, followed by dishes such as pig's trotter with braised cabbage and beer glaze, and lobster with chestnut, mandarin and chicory. What: Tuck into a sumptuous five-course dinner ($130++, $150++ for window seat) on Christmas Eve or Christmas Day, 282m above the streets at Stellar at 1-Altitude. Highlights include hand-dive scallops with burnt chilli spheres, lime pearls and caramelised corn, as well as a live station with slow-roasted smoked ribeye, turkey and bone-in ham. For dessert, have a red wine poached pear with dark chocolate pudding and pistachios. What: Save the hassle of cooking and head to Carousel restaurant at Royal Plaza on Scotts. Start the feast with a traditional roast turkey or the new Japanese garlic butter glazed turkey with garlic fried rice, minced chicken stuffing with seaweed and Japanese curry vegetables. For lunch, the rotisserie also offers oven-roasted beef loin and slow-roasted leg of lamb. Do not miss holiday favourites such as stollen, panettone and fruit cake. The buffet is priced at $68 (adult) and $43 (child) for Christmas Eve and Christmas Day lunch; and $90 (adult) and $52 (child) for Christmas Eve dinner and $83 (adult) and $49 (child) for Christmas Day dinner. What: Celebrate Christmas the Italian way with an eight-course menu ($98++ a person, add $68++ for free-flow red and white wine, prosecco and beer), along with three live stations and dessert table. Dishes include Vitello Tonnato, veal with creamy sauce; Mediterranean octopus salad; and Italian burrata with black truffle and Parma ham. The live stations feature Sardinian-style suckling pig; roasted ribeye; and flaming salt-crusted sea bass. What: Bay Hotel's halal-certified Indonesian restaurant serves a Game Of Thrones-themed feast for fans. 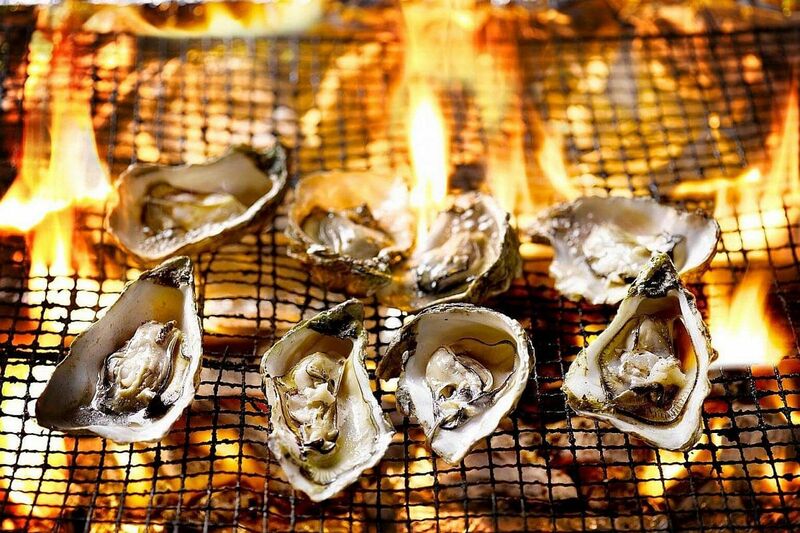 Start with Walder Frey's chicken walford salad, before moving on to beef balls in fiery sambal bajak, baked spicy stuffed cincaru (hardtail scad fish) with sambal tomato chilli padi; and Drogon's Fire Oysters, where the oysters are shucked and flamed on the barbecue. Over at The Wall Carving carvery kiosk, there is a leg of lamb tikka with mint raita and roasted Balinese turkey betutu. It is priced at $78++ (adult), $38++ (child); and $85++ (adult), $45++ (child) on Christmas Eve and New Year's Eve. What: One-Michelin-starred Japanese-French restaurant Beni draws inspiration from Hokkaido for its eight-course festive menu ($278++ a person, add $180++ for four glasses of Krug champagne). 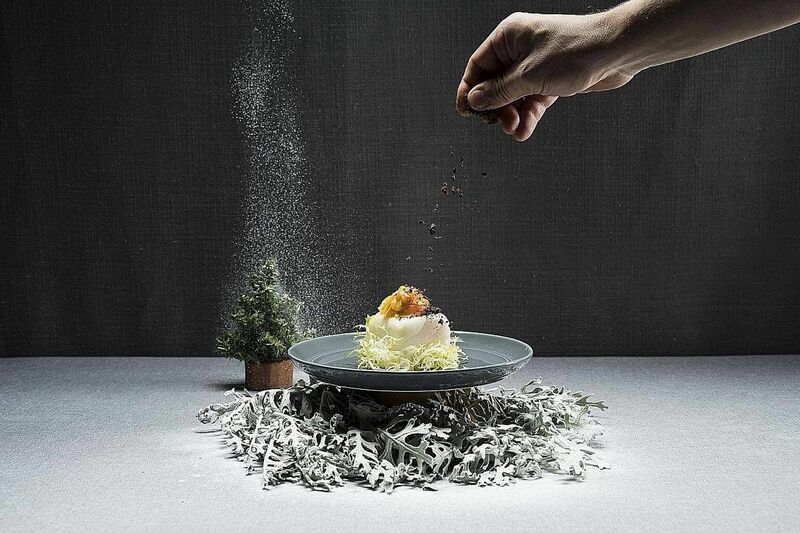 Seasonal ingredients are used for dishes such as king crab, scallop mousse and sea urchin wrapped in caul fat; shirako chawanmushi; menuke fish (rockfish), which is available only in winter; and Nozaki A5 wagyu Kagoshima beef tenderloin wrapped in houjicha-flavoured salt crust. What: Savour a white truffle six-course chef's tasting menu ($188++ a person, menu must be taken by entire table) at Osteria Mozza. The menu features tortellini in brodo (broth) with white truffle, harvested from the Piedmont region in northern Italy. Diners can also pair the prized fungus with the Primi course of their choice, such as cavatelli with winter squash and sage or blue crab and mascarpone ravioli with lobster butter. Finish with rich hot chocolate with house-made marshmallow and gingerbread man, or warm apple crisp with cinnamon gelato and creme fraiche. Correction note: The story has been edited for clarity.